The prize recognizes “an outstanding English-language doctoral dissertation in Soviet or post-Soviet politics and history, in the tradition practiced by Robert C. Tucker and Stephen F. Cohen”—two leading scholars of the Soviet Union. “Maria is an historian of extraordinary ability and intellectual range,” said her dissertation adviser Semion Lyandres, professor of European history in Notre Dame’s College of Arts and Letters. “This award is a great and well-deserved honor for her because the Tucker/Cohen Dissertation Prize is by far the most prestigious award in the highly competitive field of Soviet history and politics in North America. 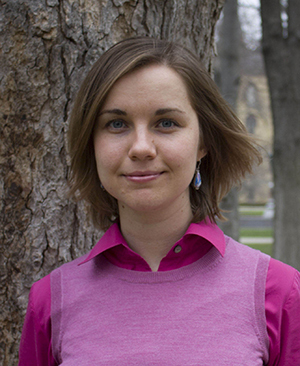 Her dissertation, titled “A History of a Town that Did Not Exist: The Soviet Scientific Intelligentsia in the Post-Stalinist Era,” focuses on one of dozens of closed towns in the former Soviet Union populated by Soviet scientists in the 1950s and 1960s. These research communities were primarily responsible the USSR’s super power status during the Cold War and for developing its nuclear technology. “We know far too little about former Soviet intelligentsia and the reasons for their willing cooperation with the regime, their internalization of the official ideology, their intellectual beliefs, and—most significantly—the causes for their rapid abandoning of communism as both dogma and a way of life during the Gorbachev period,” he said. Rogacheva, who has studied in Russia and Germany, is fluent in several languages. For her dissertation research, she gained unprecedented access to archives in the Russian town of Chernogolovka and nearby Moscow and conducted interviews with more than 25 former Soviet scientists. While at Notre Dame, Rogacheva said that she received extensive support from faculty, including Lyandres, Nanovic Institute for European Studies Director A. James McAdams, History Professor Alexander Martin, History Professor Rev. Wilson D. (Bill) Miscamble, C.S.C., and the late Sabine MacCormack, Theodore M. Hesburgh, C.S.C., Professor of Arts and Letters. Rogacheva is now working to complete a book manuscript based on her dissertation that will be the first cultural and social history of the group. For her next project, she plans to publish an edited volume of the translated interviews she conducted. “This collection of oral histories, accompanied by an interpretive essay, will give voice to the first Cold War generation of Soviet scientists,” she said.